The now infamous Julie Mao's whereabouts still remain a mystery for Detective Miller and his one man crusade. Even after his boss told him to give it a rest, the eccentric officer won't let it go, but why he feels the need to complete his mission is anyone's guess. The Expanse continues its search for phantoms. Another set of ghosts emerge in the form of miners on board Anderson Station, which we now know was destroyed by former U.N. Colonel Fred Johnson. The "butcher" as he's referred to appears to be leading a new life away from the U.N. and now oversees the construction of Space Stations and one very large ship that the Mormons need to complete their 100-year journey. His ties to the O.P.A. raise some red flags and his relationship to Naomi comes into question. She clearly knows who he is, but to what degree we don't know. A relation perhaps? The former crew of the Canterbury have a new ship they now call Rocinante, or "broken-down old horse." A funny name for a ship that is filled to the brim with rare coffee grains and excellent liquor. Every good sci-fi show needs a special ship, so here's to hoping the Rocinante can live up to the greats, like Enterprise, Galactica and Serenity. It's been fun watching the crew grow closer together with each passing week. Even the hot-head mechanic Amos has warmed up to the crew and convinces Naomi to change her mind about going to Tycho Station. Back on Ceres, Miller finally gets a chance to check on his injured partner, but seems bothered that he's been taking lessons with Gia, the Belter prostitute. Even though Miller and Havelock haven't known each other for that long, you would think he would still want justice for another cop that was attacked so brutally, but his mind remains fixated on finding Mao. Miller's Belter background seems like a crutch to him somehow, as his appearance screams of Earth, especially the hat. He says that it keeps the rain off his head, but there is more to his story than what's on the surface. Hopefully we won't have to wait long before finding out more about our troubled detective. Miller's interactions with the O.P.A. leader Anderson Dawes are always entertaining. Veteran actor Jared Harris (Mad Men) is one of the best at being a man of many faces. He claims that his organization is all about freedoms, clean air and blue sky, but could he just be another terrorist? Unlike the miners we saw in the flashback 11-years earlier, it's doubtful that Dawes' methods are completely peaceful. These two are going to collide at some point, but in the end, this reviewer is betting they will be allies. What do you think? 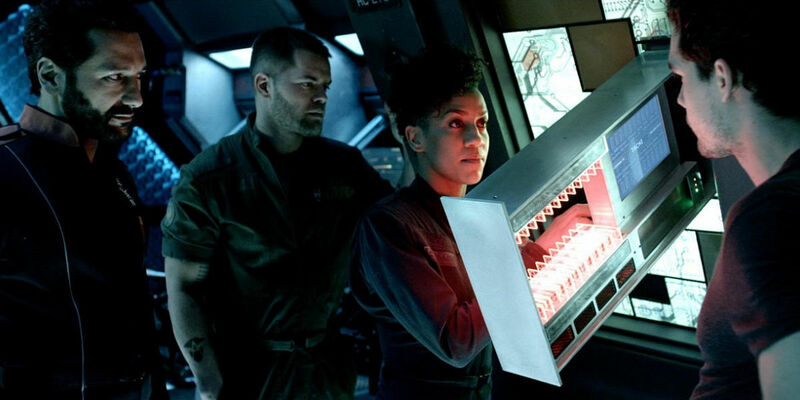 The Expanse continues to impress, as it slowly builds and builds upon itself in a way that doesn't feel daunting, or excessive. The story has many layers, but they are all equally interesting. Thankfully SyFy decided to renew the series for a second season, so we can look forward to many more episodes. Keep watching to see what happens next.